DoInventory? is your total asset tracking and inventory software for Palm OS�, Pocket PC, and Windows Mobile handheld PDAs and Windows PCs! Inventory your home, office, business, collections, etc. Carry your inventory with you. Take inventory of your personal assets for insurance purposes. Inventory your office equipment, or other items. Define your own categories, locations, and custom fields lists. Comprehensive list of fields. DoInventory? 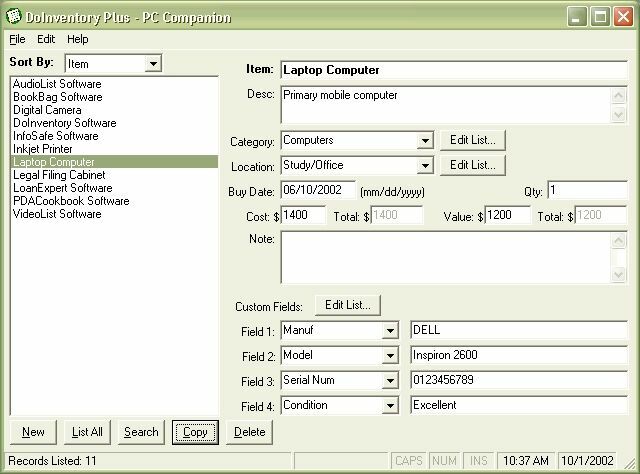 is your total asset tracking and inventory software for Palm OS�, Pocket PC, and Windows Mobile handheld PDAs and Windows PCs! Inventory your home, office, business, collections, etc. Carry your inventory with you. Import - Export Items - import and export items to and from comma or tab delimited files! Easily import your existing inventory. Multiple Custom Fields - You can choose custom fields to allow each record to show the information that you need. We provide a starting list of custom fields, but you can add and delete custom fields. Barcode Scanner Support - (Palm OS� only) - Compatible with barcode scanners including Symbol CSM150 (springboard for Visor), Symbol 1500, 1550, 1700, 1800. Preferences - Preferences screen for turning sorts on and off, setting default sort, default custom fields names, and more! Filter/Search - The versatile filtering (searching) in DoInventory allows you to filter by item, category, location or any custom field. Or, you can filter for any combination of those parameters! Password protection. Optional handheld software for Palm OS or Pocket PC included.